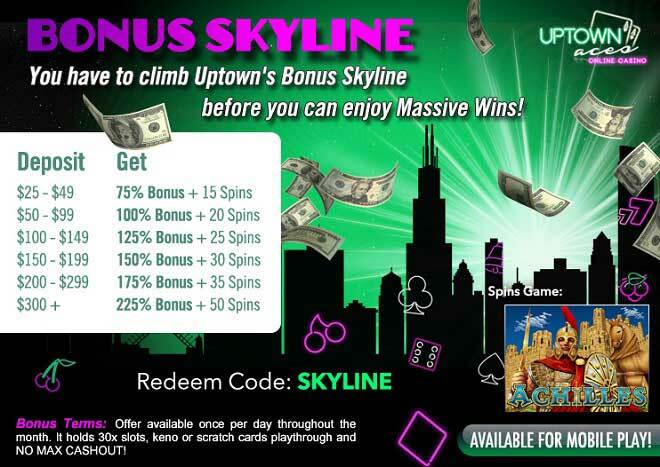 Uptown's skyline: soon you'll be part of the super-rich and will literally cast a shadow over ordinary casino players when you deposit as little as $25 and emerge an instant winner with up to a 225% Bonus and 50 Free Spins! Just like Achilles once did, this September you're going to want to stand out from the rest and become a legend. Achieve this legendary status when you deposit next and spin the reels of our mythical Achilles slot where images of the city of Troy will lead you to rewarding wilds, scatters, two bonus features and a progressive jackpot! Join the super-rich and legendary players Uptown this brand new month by simply depositing as little as $25!